In this lesson, we will learn how to calculate the momentum of a particle moving in a straight line by using the formula H=mv. Determine the momentum of a car of mass 2.1 tonnes moving at 42 km/h. Calculate the momentum of a stone of mass 520 g after it has fallen 8.1 m vertically downwards. Consider the acceleration due to gravity to be 𝑔 = 9 . 8 / m s 2 . A body of mass 12 g accelerated from rest at 19 cm/s2. Given that its motion was in a straight line, find its momentum 0.1 minutes after it started moving. Find the momentum of a body with a mass of 33 kg moving with a velocity of 18 km/h. Give your answer in gram-centimetres per second. A gun fires 97 bullets per minute. The mass of each bullet is 10 g, and the muzzle speed of the gun is 180 m/s where the muzzle speed is the exit speed of the bullet from the barrel of the gun. Find the momentum transferred to the bullets per second. A body of mass 17 kg moves in a straight line with constant acceleration of 1.8 m/s2. Its initial velocity is 22.3 m/s. Find the increase in its momentum in the first 5 seconds. A car was moving on a straight road at 109 km/h through a sand storm which was moving at 87 km/h in the opposite direction. If the mass of a grain of sand was 9 milligrams, determine its momentum relative to the car in gram-centimetres per second. Water vapour condenses on the surface of a plane in the sky and then falls in the form of drops at a rate of 14.7 kg/s. Given that the mass of one water drop is 0.39 g, determine the momentum of a water drop when it reaches the surface of the ground from a height of 1‎ ‎000 m. Take 𝑔 = 9 . 8 / m s  . Find the height from which a body of mass 0.3 kg would have to fall in order for the magnitude of its momentum just before hitting the ground to be equal to the momentum of a body of mass 63 g moving at 336 km/h. At time 𝑡 , a car with a mass of 7 tonnes, is travelling along a racetrack at a speed of 161 m/s and is burning fuel at a constant rate of 10 kg/s. Given that the car’s momentum at time 𝑡 is equal to it’s momentum at a time 10 seconds later, find the velocity of the car after this 10 seconds. Give your answer to the nearest km/h. 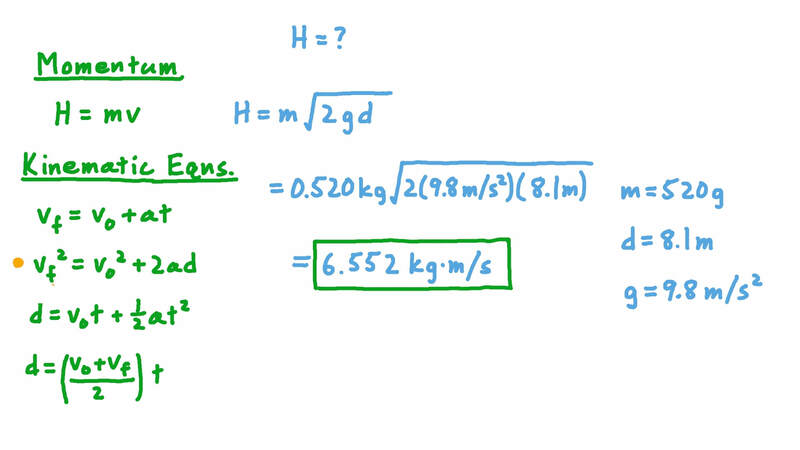 A horizontal force of magnitude 265 kg-wt started acting on a body of mass 10 kg at rest on a horizontal plane. Given that the body started moving and that the resistance to its movement was of magnitude 2,208 N, find the momentum of the body 4 seconds after the force started acting on it. Take 𝑔 = 9 . 8 / m s  . A cannon of mass 2.7 tonnes was moving at 2 km/h in a straight line whereas the cannon ball of mass 10 kg was moving at 124 m/s. Given that the momentum of the cannon is 𝐻 1 and the momentum of the cannon ball is 𝐻 2 . Which of the following statements is true? A broken-down car of mass 1.2 tonnes was being pushed along a horizontal road. Starting from rest, a force of 240 kg-wt acted on it for 9 seconds. When the force stopped, the car continued to move freely. It came to rest again 19 seconds later. The resistance to the car’s motion was constant throughout its movement. Using the relationship between impulse and momentum, find the maximum speed the car reached. Consider the acceleration due to gravity to be 9.8 m/s2. A bullet of mass 24 g was shot horizontally at 496 m/s towards a wooden body of mass 1 kg which was resting on a rough horizontal table. The bullet lodged into the wooden block, and they started to move together as one body across the table. After sliding across the table for 70 cm, this body collided with a perpendicular barrier fixed to the table. It rebounded at 66 cm/s. Given that the resistance of the table to the movement of the block was 39.7 N, find the impulse of the barrier on the body. A sphere of mass 163 g hit a vertical wall as it was moving horizontally at 67 cm/s. Given that it rebounded in the opposite direction and the change in its momentum was 11 899 g⋅cm/s, determine its speed after it struck the wall. A rubber ball of mass 41 g was moving horizontally along a smooth surface. It struck a barrier at 62 cm/s and rebounded in the opposite direction at 45 cm/s. Find the magnitude of the change in its momentum as a result of the impact. A sphere 𝐴 of mass 1.5 kg was moving at 10.4 m/s across a horizontal plane. It collided with another sphere 𝐵 of mass 2 kg that had been at rest on the same plane. Given that the ratio between their respective speeds after collision was 5 ∶ 6 , find the loss in the kinetic energy as a result of the impact. A ball of mass 400 g moves in a straight line along a smooth horizontal surface towards a vertical wall with a constant speed of 16 m/s. Given that the direction of the ball’s motion is perpendicular to the wall, and that the wall exerts an impulse of 11 N⋅s on the ball during the impact, find the rebound speed of the ball. From a point that lies 225 cm below the ceiling of a room, a ball of mass 51 g was projected vertically upwards with a speed of 885 cm/s. If the change in the ball’s momentum when it hit the ceiling was 36 720 g⋅cm/s, determine the ball’s speed after the collision. Consider the acceleration due to gravity to be 9.8 m/s2. A rubber ball of mass 10 g fell from a height of 8.1 m onto a section of horizontal ground. It struck the ground and rebounded to a height of 4.9 m. Calculate the magnitude of the change in momentum that resulted from the impact. Take 𝑔 = 9 . 8 / m s 2 . A rubber ball fell vertically from a height 6.4 m above the ground. It then rebounded to a height of 1.6 m. If the change in the ball’s momentum due to impact is 1 113 kg⋅cm/s, determine the ball’s mass. Take 𝑔 = 9 . 8 / m s 2 . A rubber ball of mass 54 g fell on a section of horizontal ground. Its speed just before hitting the ground was 41 m/s. After striking the ground, it rebounded to a height of 250 cm before it momentarily came to rest. Taking 𝑔 = 9 . 8 / m s  , determine the magnitude of the change in momentum which resulted from the impact. A ball of mass 148 g was projected vertically upwards at 7.7 m/s from a point 2.4 m below the ceiling of a room. It struck the ceiling and rebounded at 1.6 m/s. Determine the magnitude of its change in momentum as a result of the impact with the ceiling. Consider the acceleration due to gravity to be 9.8 m/s2. A body of mass 5 kg is projected vertically upwards with velocity 25 m/s. Find the magnitude of the change in its momentum in the first 2 seconds. Take 𝑔 = 9 . 8 / m s 2 . A body of mass 5 kg fell into some water. It fell vertically for 2.2 seconds before reaching the surface of the water. Then, as it moved through the water, it descended vertically at a constant speed such that it covered 3.9 m in 1.5 seconds. Find the magnitude of the change in its momentum as a result of its impact with the water.